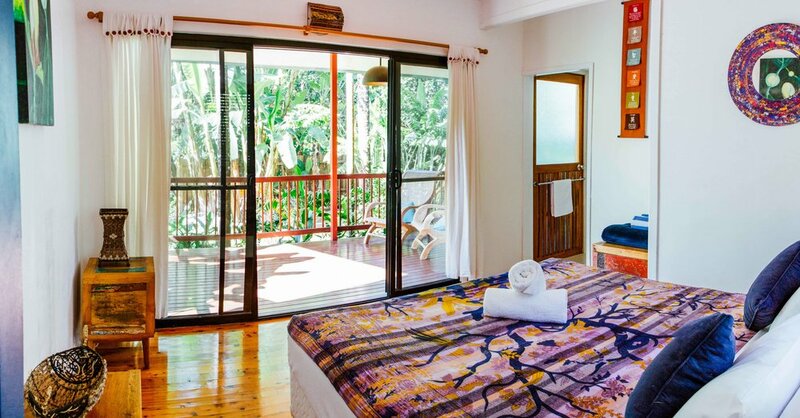 Wildwood's Betel Nut House is ideal for families and small groups to relax in the Daintree rainforest, immerse yourself in nature and unwind. It accommodates 4-6 guests with views of the gardens and rainforest from every room. The house is furnished with handmade balinese furniture and offers three times the living space of the cabins. It provides a master bedroom with king size bed, large ensuite bathroom with shower and roll top bath. It has a study (with comfortable sofa bed which acts as a second, open plan bedroom). An adjoining garden apartment with king size bed (or two king singles), ensuite bathroom and large verandah with recliners is also available for guests. The house provides a newly installed modern kitchen, large lounge with fireplace, HDTV and music centre, and two huge verandahs with balinese daybeds, recliners and handmade wooden furniture. There is also a large gazebo with a bbq, 7m long handmade dining table, daybed and hammocks where guests can relax, listen to the birds and watch the butterflies. While at Wildwood guests have the chance to cook on an open fire under the stars. We have created an open air fire pit with landscaped gardens, benches and table for guests to enjoy just a few metres from the house. Wildwood is self sufficient in the generation of electricity and storage of water - we use solar power and harvest rainwater to minimise our carbon footprint and allow guests to do the same. Wildwood has a large library of DVDs and books for guests enjoyment, as well as TV, wi-fi and landline. Note there is no mobile phone coverage in Cape Tribulation so enjoy the experience of escaping from the rest of the world!